(Phys.org)—Back in the 1980s, the arrival of asteroid 2201 Oljato inside the orbit of Venus heralded a flurry of magnetic activity. Now, results from ESA's Venus Express spacecraft suggest that Oljato has lost its magnetic mojo. Dr Christopher Russell will present an explanation for Oljato's strange behaviour at the European Planetary Science Congress in Madrid on Tuesday 25th September. Oljato orbits the Sun once every 3.2 years. During its lifetime, NASA's Pioneer Venus Orbiter observed three passages of Oljato between Venus and the Sun. Each time, there was a marked increase in the region of unusual magnetic peaks known as Interplanetary Field Enhancements (IFEs), both ahead and behind the asteroid. Russell said, "This is not typical asteroidal behaviour! These magnetic increases are rare, occurring in Venus orbit about 10 times per year. Pioneer observed that when Oljato was just in front or just behind Venus, the rate of IFEs approximately trebled. And yet, in more recent observations with Venus Express, the occurrence of IFEs is now lower than the average we find outside this region." Russell and his team believe that the answer to this discrepancy lies with collisions between Oljato and debris in its orbit. When objects collide in interplanetary space, they become electrically charged and dust particles are accelerated by the solar wind. Russell explained, "At one point in time Oljato shed boulders – mostly a few tens of metres in diameter – into its orbit and they formed a debris trail in front and behind Oljato. These impactors then hit other targets as they passed between Venus and the Sun. The large amount of fine dust released by these collisions was picked up by the solar wind, producing the IFEs observed by Pioneer, and was accelerated out of the solar system." The reduced rate of IFEs observed during the Venus Express epoch suggests that the collisions with Oljato's co-orbiting material have reduced the general debris in the region as well as the co-orbiting material shed by Oljato. "The IFEs observed by Pioneer suggest that more than 3 tonnes of dust was being lost from the region each day. Effects associated with solar heating and gravitational perturbations have gradually nudged larger chunks of debris away from Oljato's orbit. From once being unusually crowded, the region has become unusually clear and free of IFEs," said Russell. I would like more information - this sounds like a general answer for objects that shed material in their orbits - do comets generate more IFEs? 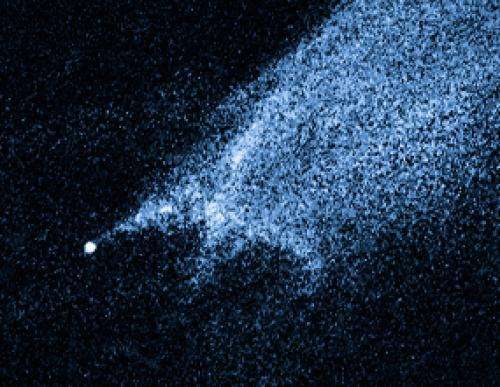 why is this asteroid exhibiting unusual behavior - do other asteroids not shed material? They almost go out of their way to ignore the electrical nature of the Sun's plasmasphere and all of the bodies within it. The display of ignorance is incredibly laughable. Another attempt by the government to hide local alien activity?? ?